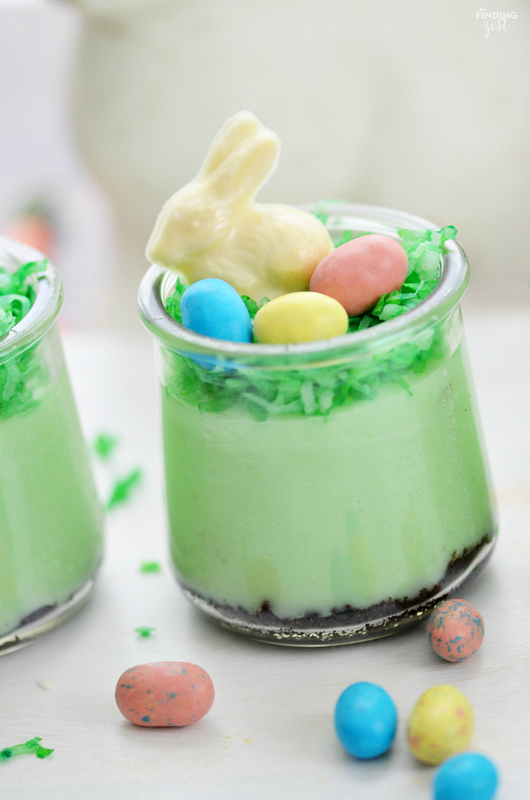 Easy Easter desserts are my favorite. 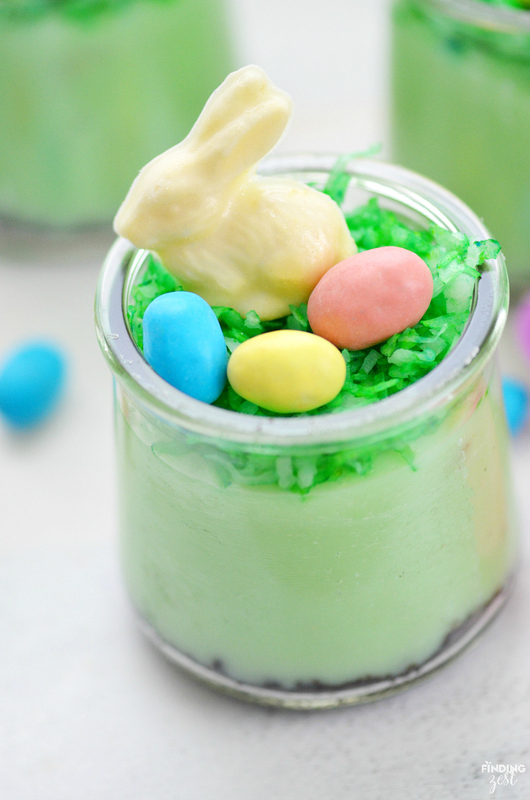 With all the other festivities surrounding Easter, I prefer cute Easter desserts that take very little time to prepare but I know my kids will love. 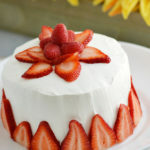 Spring parfaits like this strawberry pound cake variety are always a fun option. 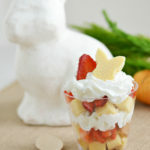 This year I wanted to do a pudding parfait even though my middle son usually skips pudding desserts. The one exception is with pistachio pudding which everyone in my family enjoys. 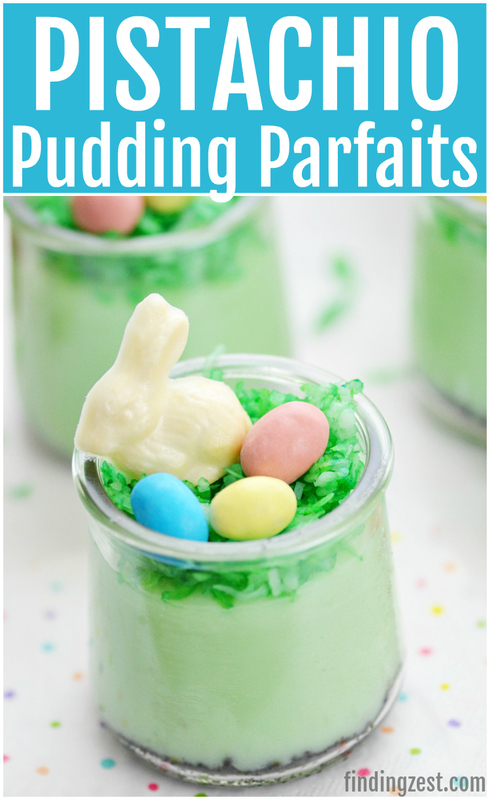 Since the color and flavor screams spring to me, I decided to create these pistachio pudding dessert parfaits. 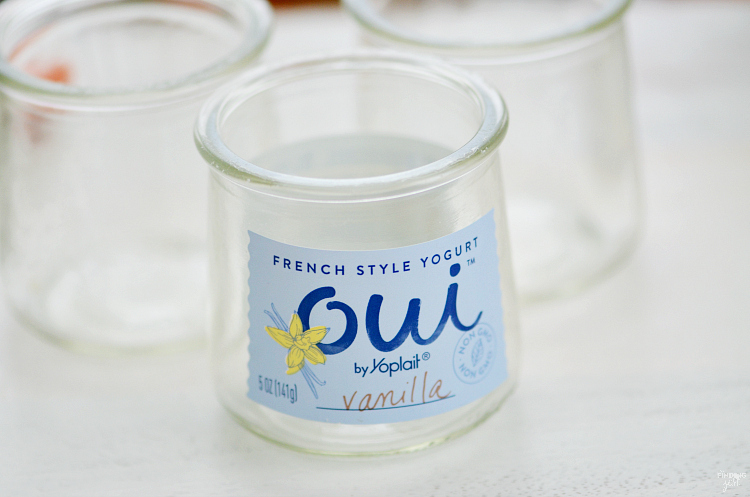 Have you try oui yogurt by Yoplait? It is pretty heavenly, although you do pay a premium price for this indulgent french style yogurt. They come in the most adorable little glass jars that are just begging to be re-purposed. They don’t have lids but did you know you can buy lids that fit oui jars? We had several sitting on our kitchen counter and my six year old kept asking what we were going to do with them. He felt we should put something in them, but he didn’t know what. 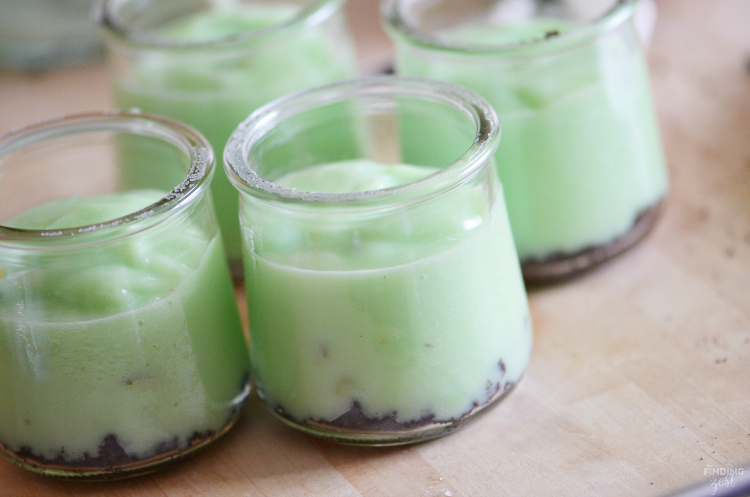 Oui jars are the perfect size for these pistachio pudding parfaits. 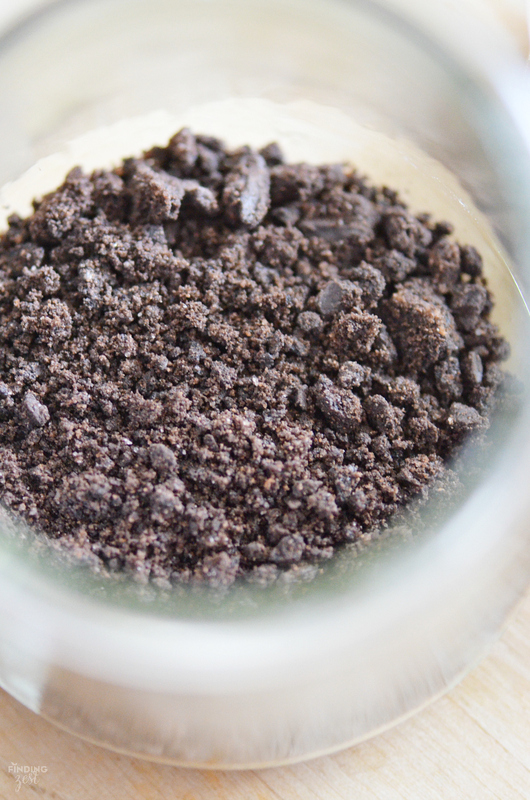 I wanted my parfaits to start with a “dirt” bottom so I used crushed oreo cookies that I already had on hand from another Easter dessert project. (Watch for that in an upcoming post.) I did remove the cream filling before grinding them in my food processor but you wouldn’t have to for this parfait recipe. 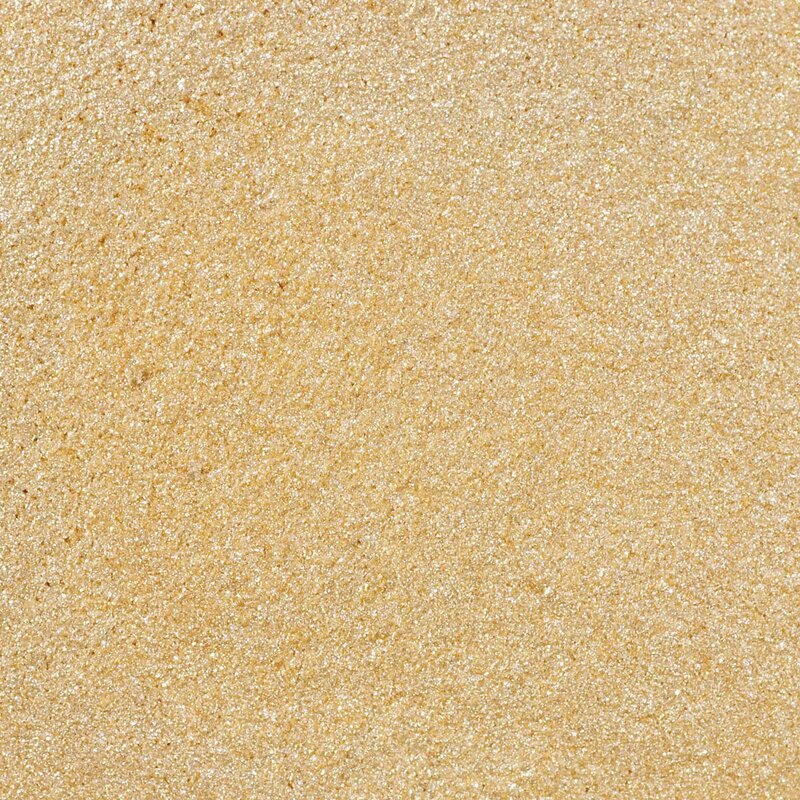 Crushed nilla wafers or graham crackers would also work well for the base. I first added a tablespoon of the cookies to the bottom of my glass jars. 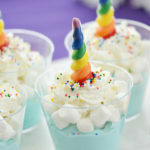 You can also use any 5 or 6 oz parfait glass or small clear disposable party cup you have on hand. Next I made my pistachio pudding. I poured the pudding evenly into the glass jars immediately after whisking so the pudding didn’t have a chance to set. I would give your parfaits a chance to set in the fridge for at least 15 minutes before serving. 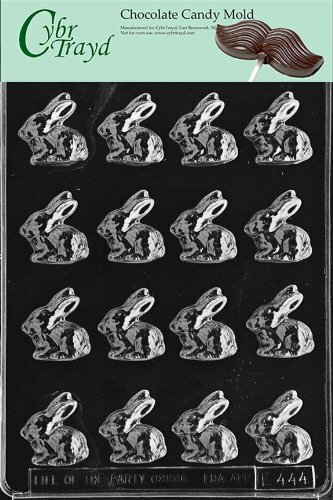 To help make this process even quicker you can purchase small chocolate bunnies or you can use this bite sized bunny mold that I picked up from Amazon and make your bunnies ahead of time. 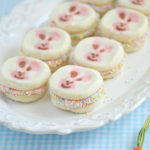 For an extra special touch to my white chocolate bunnies, I added a little edible gold pearl dust to make them sparkle. 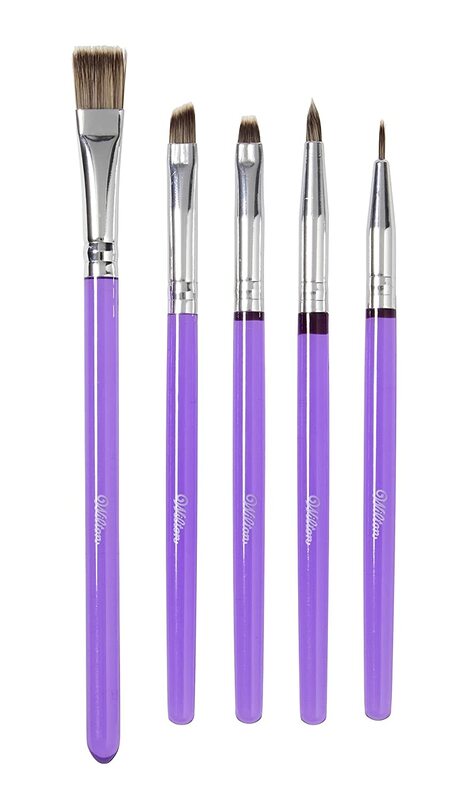 If you do this optional step be sure to buy food safe brushes to apply your gold dust. You will also want to color your coconut “grass” with a drop or two of green dye. I like to place both the coconut and dye in a ziploc bag and then shake to coat. It is less messy and I can just throw the bag away after I’m done. For my eggs I used Whoppers Mini Robin Eggs because they are my favorite. 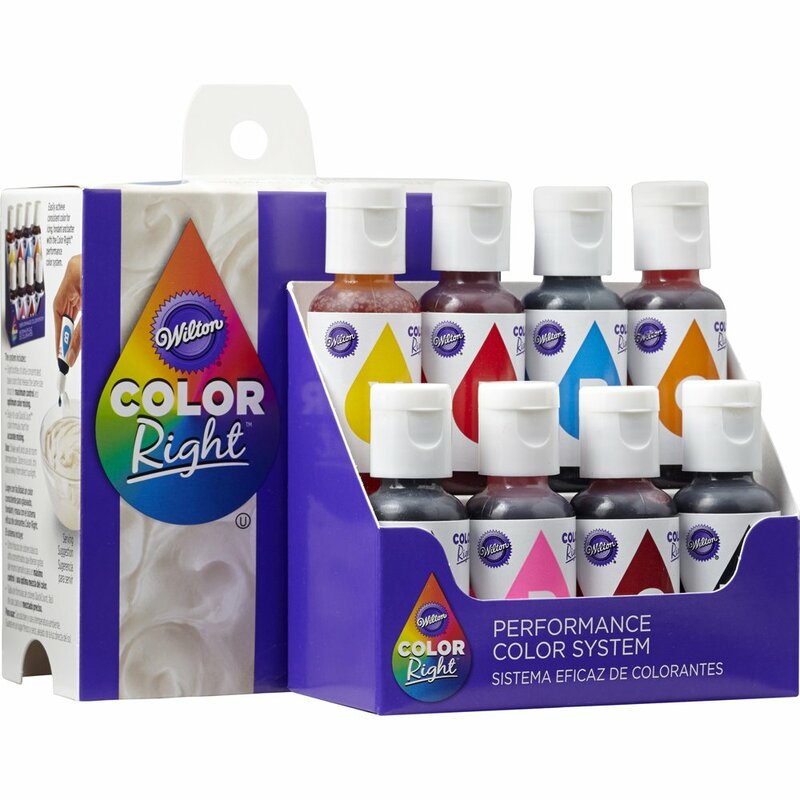 But any mini chocolate eggs or even jelly beans would work well. 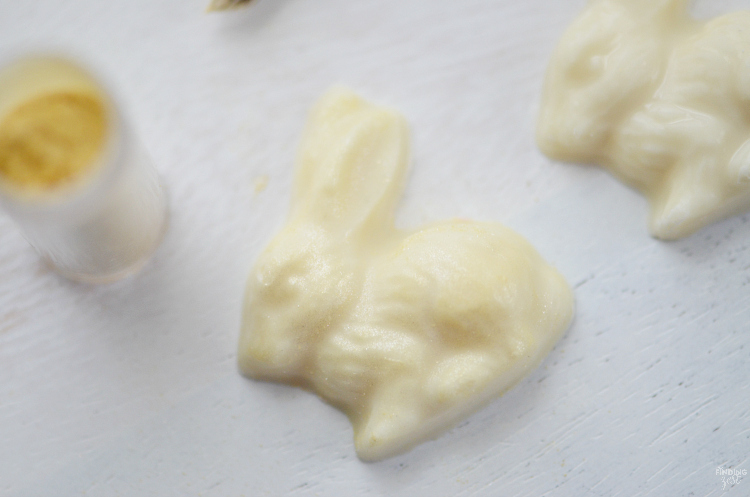 Make chocolate bunnies using mold if making homemade. (Can be prepared days in advance.) Brush with gold dust, if desired. Add 1 tablespoon crushed cookies to bottom of four small (5 to 6 oz) parfait dishes. Pour evenly into dishes before it has a chance to set. Refrigerate for at least 15 minutes, up to 4 hours. In Ziploc bag, and coconut and one or two drops of green dye. Seal and shake until fully coated. 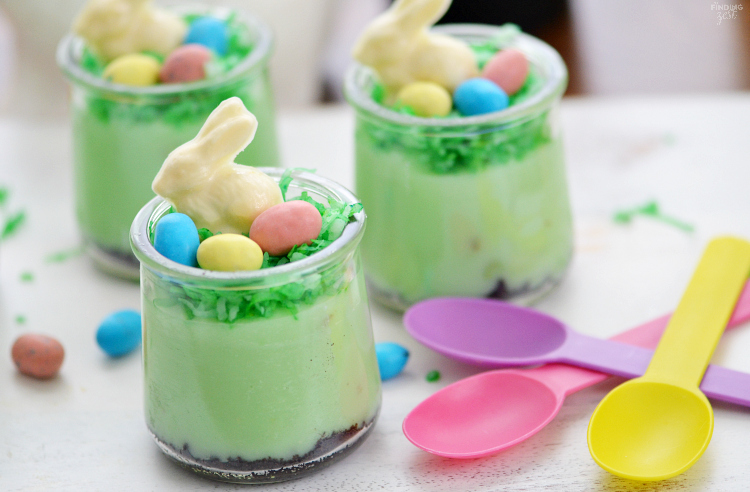 Before serving, top each parfait with 1 tablespoon of green coconut, chocolate bunnies and three Mini Whopper Robin Eggs. That is all there is to making this pistachio pudding dessert and there are several ways to cut even more corners if you are short on time. So cute! 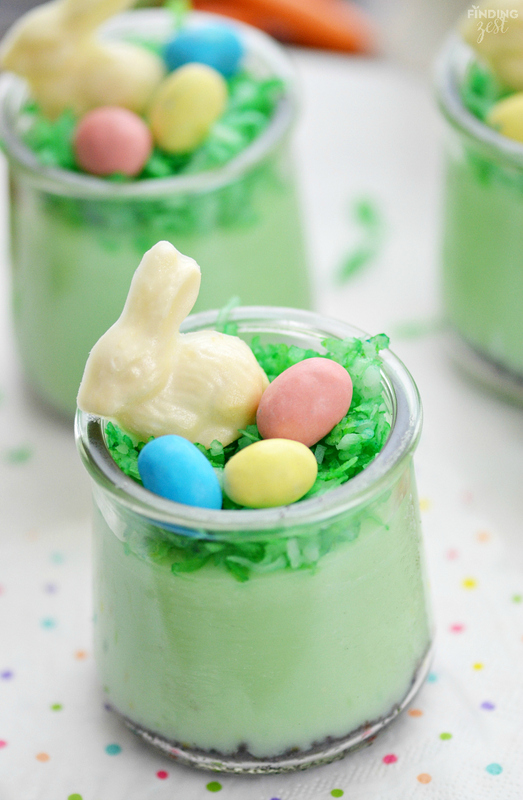 I love easy Easter recipes like these. Especially no bake! 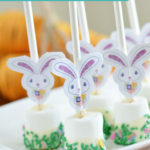 What a fun Easter treat! 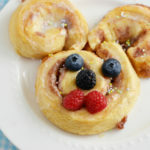 So easy to make and super delicious!